Size of Male: 50-65 lbs., 20-23 in. Size of Female: 40-55 lbs., 18-21 in. 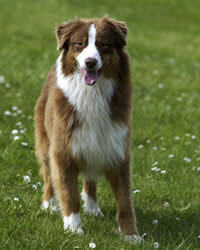 The Australian Shepherd is smart, energetic and will not disappoint. Two popular, iconic features are a docked bobtail and interesting eye color combinations of brown, hazel, blue and amber. “Australian Shepherd” is quite a misleading name for a breed that isn’t really Australian. The dogs were in fact the 19th-century Basque shepherds that traveled with their European masters to America. There are two theories behind the “Aussie” moniker. First, the group stopped over in Australia before relocating to America. Second, most of the herding dogs imported from Australia sported the merle coloring which is common with this dog breed. There’s a lot to like about this breed. It is a faithful companion, a playful pet and an effective guard dog. However, its herding nature can pose a bit of a problem. It tends to bark, chase anything that moves and nip at your heels or hands. It could also attempt to “herd” other pets in your home. Inadequate socialization, mental stimulation and physical activity may spur behavioral problems. Living Environment – This is NOT among the best apartment dogs. If you keep them cooped up, they could make a mess of your place. The dogs require a yard to run and play. Just make sure the area is secured and free from moving objects, or you might see your pet chasing bikes and cars. Grooming – Coat care for this athletic breed is relatively minimal. Depending on the length of their hair, some Australian Shepherds require more grooming attention than others. Expect your dog to shed heavily at least two times a year. During these periods, frequent brushing and grooming are necessary. Diet & Exercise – As with most canines, this lively dog breed lives on a high-protein diet. Limit the feedings to three times a day if your pet is younger than 3 months. Thereafter, you may decrease the frequency to twice a day to prevent bloating and excessive weight gain. This dog breed has a high level of exercise needs to match its active nature. Regular walks aren’t enough. Routine exercising will bore these herding specialists. They need constant stimulation and socialization. They will definitely enjoy family outings and various outdoor adventures. Health – This agile and active breed isn’t 100 percent invincible. Hip and eye tests are strongly suggested. Common dog health problems include cataracts, glaucoma, spinal defects, cancers and skin allergies. Merle coloration also makes the breed susceptible to blindness and deafness. The “Aussie” is one of the most trainable and capable dogs around. They are eager to learn and savor mental challenges. The catch is you have to convince them first that you are the boss and you have to keep the lessons interesting. If you fail to establish yourself as the pack leader, the dog can get manipulative. For this dog breed, respect training is mandatory and repetitive exercises ineffective.